Removed decades ago, the Pierre Bourdelle murals once again grace the walls of the Losantiville Dining Room. The canvas works of Pierre Bourdelle are once again hanging in the Losantiville Dining Room after being taken down several decades ago to prevent further damage. GBBN Architect Nick Cates says the food-themed murals were sent to New York for restoration. "They removed the varnish and all the years of nicotine and dirt that had accumulated, which was quite a lot," Cates says. "When we saw these things before they were shipped out they were pretty dark. Some of them you could barely tell what was on them. But they were able to get that layer of soot and dirt off and then infill paint and revarnish them so it brings all their color back to life." The most damaged of the group, panel 12, was nearly scrapped. However, art restorers were able to bring it back to life. Restorers worried one of the 22 canvas murals was beyond repair and would have to be recreated. "It had a lot of missing paint. It had a lot of dirt on it and it had been roughed up over time," Cates remembers. 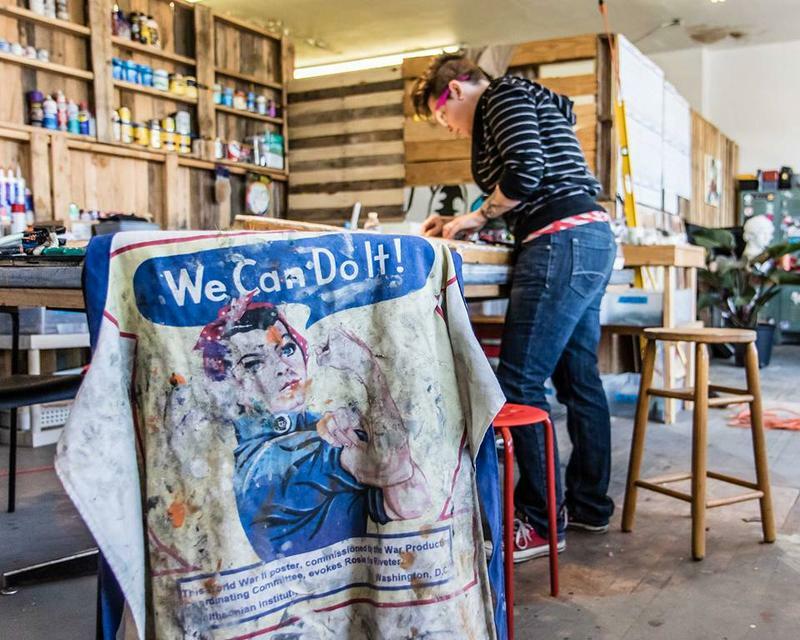 "After they got it to the studio they thought that it was worth giving it a try, so they went through a whole process to remove the layer of varnish and the dirt. Then after they did that, there was enough there that they thought that they could try it. They did a lot of infill painting and actually did a great job of restoring it." The dark square at the bottom of the image is a patch of the ceiling mural that was left uncleaned in order to give visitors a glimpse of how much grime was removed and how the mural was repaired. Bourdelle's ceiling mural in the entry vestibule has also been brought back to life. A small section was left as-is so visitors with a careful eye can see how much work was done. The Losantiville Dining Room will now serve as the main lunch room. 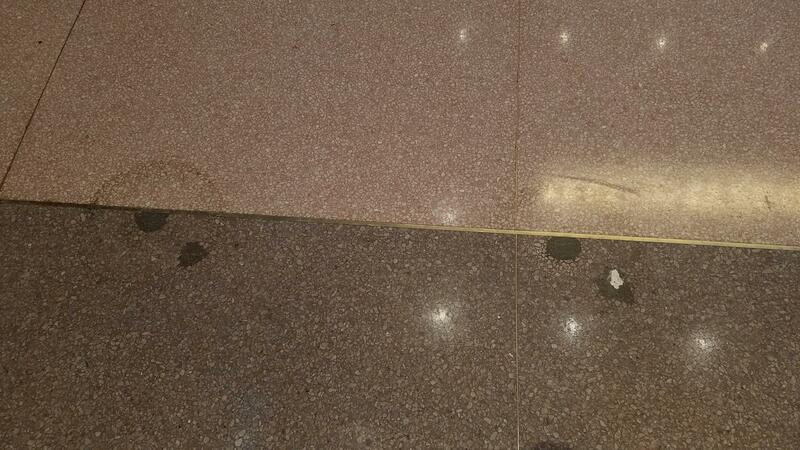 If you look down, you'll see concrete patches and outlines of where the original lunch counter stools once stood. New green terrazzo was installed in the flooring to show were the serpentine lunch counter would have been. 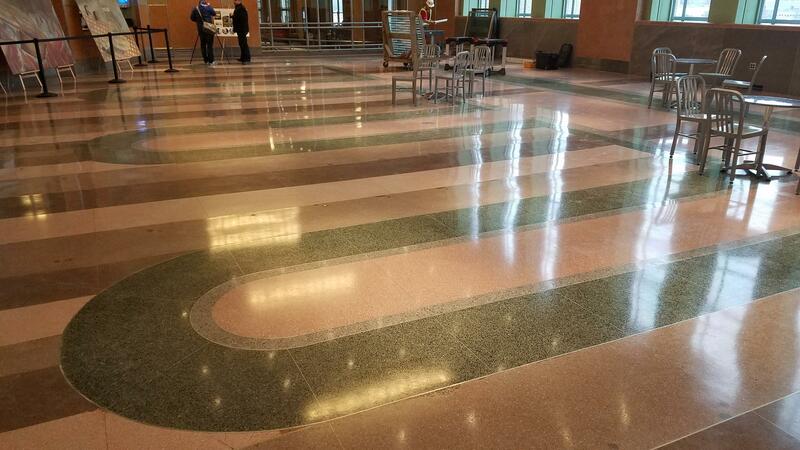 Green terrazzo swirls in a serpentine pattern mimicking where the original lunch counters once stood. 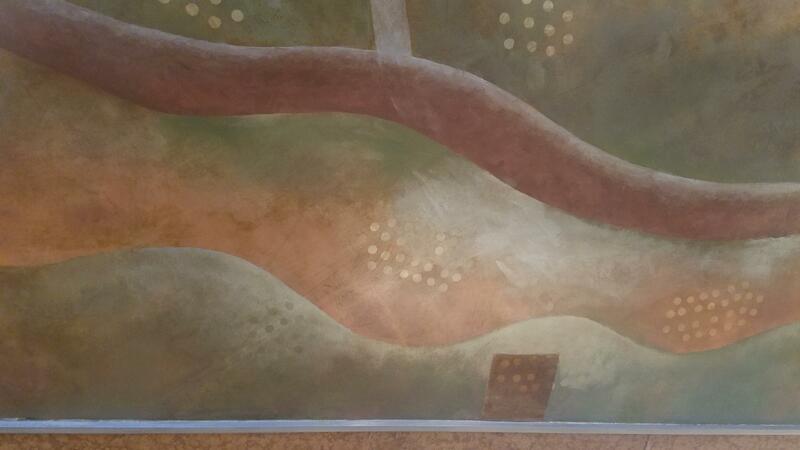 The colors in the paintings are similar to those in the room, all having been designed to flow together. Cates says it's clear they were created for this particular space. The paintings may give the allusion of being a typical size, but each is roughly six feet tall, Cates estimates. They vary in width depending on their location around the upper boarder of the room's high ceiling. Restoration crews used old pictures of the lunch room to determine the original location of each mural. The design team chose to leave visible the concrete patching where the lunch counter stools were previously installed. If you look closely you'll see the outline of the stool's base ringing each patch. The paintings were done on canvas which was affixed to the plaster walls rather than wooden stretchers. 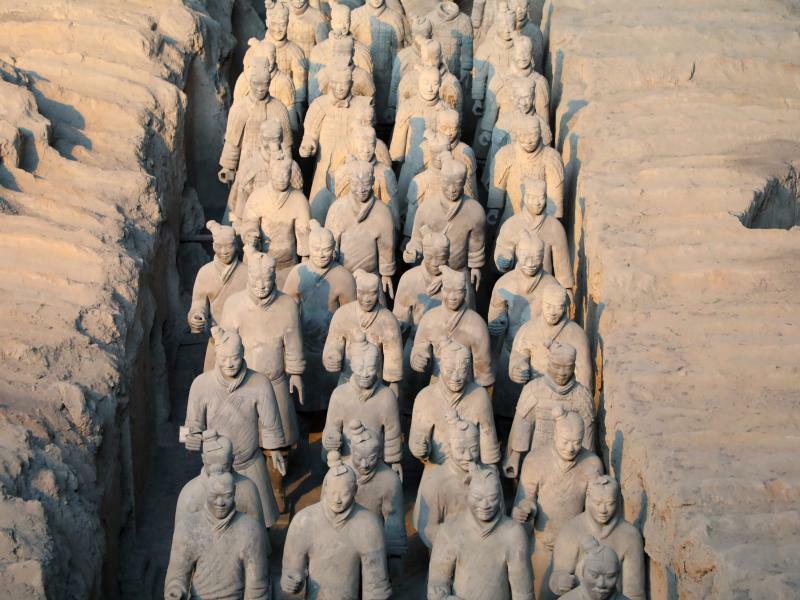 They remained on the walls through the 1980s. Cates says they were taken down and put in storage when the Cincinnati Museum Center moved in because there was damage to the ceiling and some mechanical systems were being replaced. 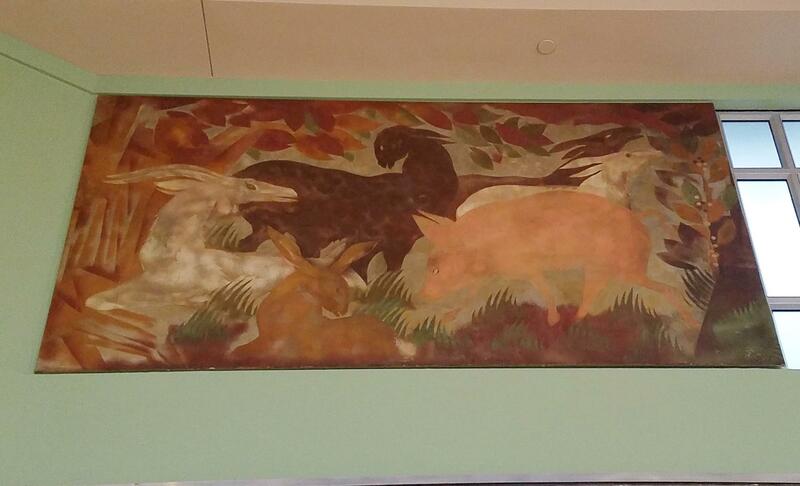 Some of the murals feature still lifes of fruits and vegetables and bread while others depict live animals. Pierre Bourdelle was a French-born artist that did a lot of work for railways during his career. According to the Cincinnati History Library archives, "Bourdelle would ultimately create 5,496-square feet of work for Union Terminal, by far the largest single project of his career." 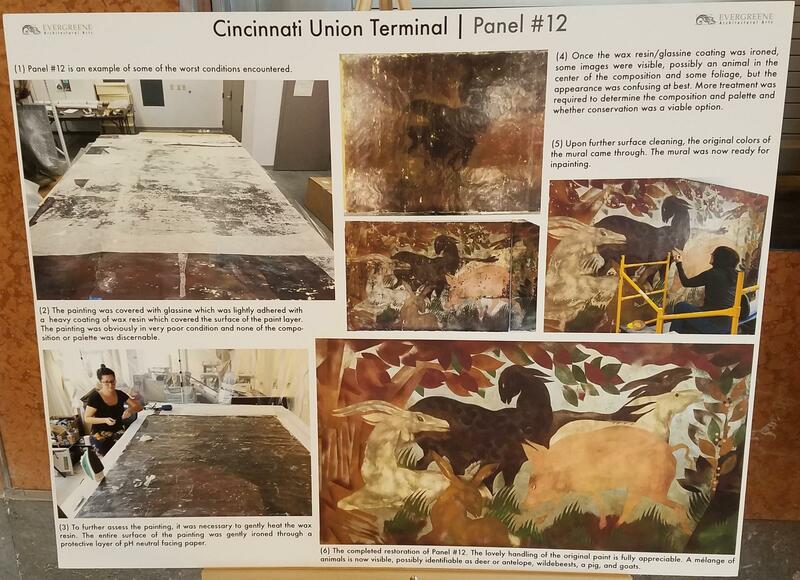 Several panels depict how art restorers cleaned, repaired, and infilled the 22 murals. This particular mural was thought in too bad of condition to repair, but restorers persisted and were successful. According to FrenchSculpture.org, Bourdelle's Union Terminal interior works "define American Art Deco, a result of the synthesis of Austro-German modernism with French Art Deco." The Cincinnati Museum Center reopens in the renovated and restored Union Terminal Nov. 17.